Uncertainty, fear and bewilderment stalk the streets of Italy following an election in which the system failed to produce outright winners, reports Shamik Das. Pier Luigi Bersani’s centre-left coalition looks assured of a majority in the Chamber of Deputies, with Silvio Berlusconi’s centre-right alliance and wildcard Beppe Grillo gaining enough seats in the Senate to deny him a majority – even with the support of prime minister Mario Monti, whose continuity centrists trailed in fourth. In terms of share of the vote, in the Chamber of Deputies, the centre-left coalition is set for 29.55%, fractionally ahead of Berlusconi’s centre-right alliance on 29.18%, with Grillo on 25.54% and Monti on 10.56%, while in the Senate, Bersani’s bloc stands at 31.7%, with Berlusconi on 30.65%, Grillo on 23.77%, and Monti on 9.15%. Turnout is reported to be around 75 per cent, the lowest since the Second World War. It was a day (and night) of high drama, shock and no little confusion, following utterly inaccurate exit polls which, for the Chamber of Deputies, put Bersani on 34.5%, Berlusconi on 29%, Grillo on 19%, and Monti on 9.5%, and for the Senate, had Bersani on 37%, Berlusconi on 31%, Grillo on 16.5%, and Monti on 9%. It was an initial picture that, as soon as the first results came in and more ballots were counted, looked more and more wrong, with Grillo’s rise and rise and Berlusconi’s rise from political death the stories of the count. Bersani’s party appeared the most disappointed, having led for so long, and indeed leading the final vote but denied a majority in both houses. In a bizarre turn, Monti described himself as “satisfied” with the election, despite getting less than 10 per cent, one of the worst ever results of an incumbent in democratic history. He lambasted the system, saying no country has such a bad electoral law as Italy, adding Grillo’s result was beyond expectations, but not surprising given the dissatisfaction towards the main parties. Earlier, Partito Democratico deputy leader Enrico Letta told reporters gathered at the PD’s election centre in Rome’s Casa Dell’Architettura the vote was a “rebellion” of the electorate. He said it was the responsibility of the party that wins in the lower house to try to form a government. The election results created a borderline, he said, adding re-running the elections is not the solution at the moment, and President Napolitano should help the parties form a government. 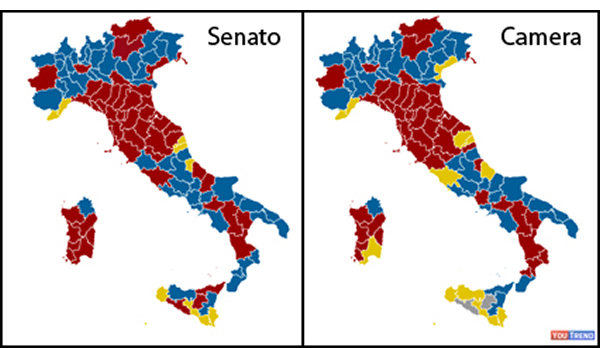 Looking ahead, three options present themselves: a ‘grand coalition’ of national unity (unlikely); the installation of another technocratic government (highly unlikely); or fresh elections in a few months (the most likely) – though the PD will want to try and get reform of the Italian electoral system through parliament in the interim, so as to make a repeat of the current deadlock less likely in the future, though Berlsuconi will likely block such a deal. In such a circumstance, as seems distinctly possible, the spotlight will fall more heavily on Grillo, who will have to make up his mind whether he wishes to govern, adopting a certain degree of credibility and abandoning some of his more fanciful policies – or roll the dice and force another election, in which his popularity and vote share could grow, or reality could dawn and he could sink, which for him and his supporters would be no laughing matter. In the current uncertainty, expect to see and hear plenty more of Beppe Grillo; and we’ll have more reaction and analysis from Italy later this week on Left Foot Forward. It would hardly be rolling a dice for Grillo. With the 25% vote this time from a starting point of 0%, he will have gained a level of credibility among voters and clearly win the lower house if further elections take place. Mainly due to the ridiculous rule which gives the lower house to whichever coalition wins the most votes. Why is it such a ridiculous rule to give control to the lower house with the most votes?